Audiobooks have only been available on Google Play for barely two months, but Google is already working hard on improving the experience. 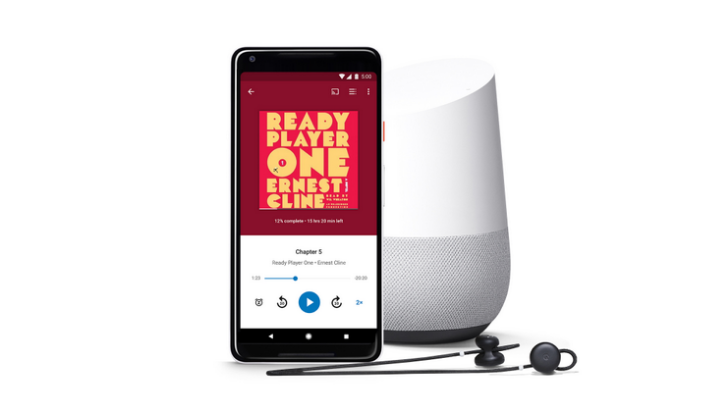 In a blog post today, Google revealed a few of the new features and improvements it has been adding to make it even more enjoyable to listen to an audiobook with Google Play, whether on the app or through Google Assistant. With 'Smart Resume,' playback will now intelligently resume a few moments before where an audiobook was paused. Resuming a book mid-sentence after a user had to interrupt their listening can be slightly jarring, so Smart Resume rewinds back to the beginning of the word or sentence the listener was on to make it easier to follow along. Another useful addition for readers who are in a rush is the ability to speed up and slow down the playback speed of the book anywhere from 3x down to 0.5x. For those who read using the Google Play Books app, you can now also save a favorite moment in an audiobook with the new Bookmarks functionality, just like you already can with regular ebooks. On the Google Home app, audiobooks can also be added to a morning routine with Google Assistant, so saying “Ok Google, tell me about my day,” on your commute to work will let you know about traffic, inform you of calendar appointments for the day, and continue playing the audiobook you're currently reading. Finally, Family Sharing is also coming to ebooks and audiobooks in 13 new countries: Belgium, Germany, Italy, Netherlands, Norway, Poland, Russia, Spain, Switzerland, Chile, Mexico, Japan (audiobooks only), and South Africa. Books can be shared with up to five different people (depending on the book), and can be read on either the app or the web.